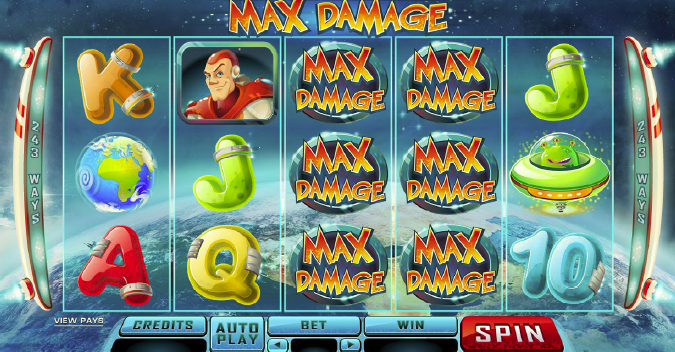 Home Slot Machines Join Max Damage in this brand new slot! Join Max Damage in this brand new slot! 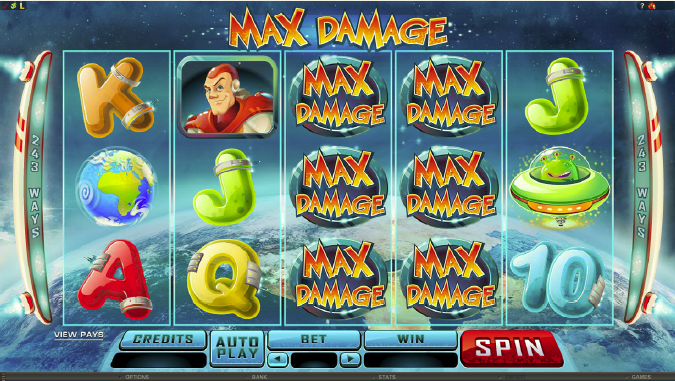 Max Damage is a thrilling new slot game from Microgaming (Swedes call it ‘spela casino‘, and must be for a reason! ), and from what we’ve seen, it looks incredibly promising. This exciting game is a follow up to the action-packed arcade game Max Damage and the Alien Attack, and it unleashes another wave of deadly alien activity. Gear up and use your spinning talent to save the world together with Max. In this 5 x 3 reel game with 243 winning chances, players enter a base camp, then soar over the atmosphere of the earth, as spaceships swoop down across the reels. Max is in the cockpit, and set to protect the earth from invaders, in this battle for the survival of the world. Challenging, yet incredibly enticing, Max Damage is the kind of slot you’ll be playing for the rest of the year. It’s just addictive! Players can get stacked Wilds three high on all reels, and that’s when the wins take off. Getting 3 to 5 Scatter symbols will trigger up to 15 Free spins. Players will be thrilled as the wins add up, with an additional 2x multiplier in place. When alien spaceships appear, Max can blast them off of the reels, for fantastic prizes. Massive wins are possible, up to 120,000. The game design features a new take on the classic gaming experience. Designers took the 1980s arcade theme, and updated it for a fun, fresh feel. The game is set amid the stars, and players can experience environments from the outermost atmosphere of the earth to the depths of outer space. Graphics feature glowing animations and vibrant colors, and the overall effect is attention-getting and engaging. The symbols used all tie into the space theme, with space stations, rocket ships, and invading aliens. The sound effects also follow the style of a 1980s arcade game, updated for today’s audience. Microgaming releases Red Hot Devil!